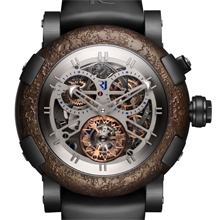 RJ-ROMAIN JEROME CHRONO TOURBILLON NOW AVAILABLE! With its rugged good looks and adventurous spirit, the Chrono Tourbillon is the new flagship model of the Titanic-DNA Collection by RJ-Romain Jerome. Its legend is on a par with the great ship it once was: stupendous, dreamlike… its name alone is enough to conjure up its image: Titanic. A concentrated blend of strength, adventure and genius that has become synonymous over the years with absolute luxury. For devotees of thrills, History and unique emotions, RJ-Romain Jerome now introduces a rare watch of which each of the three steel, black PVD or red gold versions is issued in a 9-piece limited edition. Fusing the material of the Titanic with the finest watchmaking expertise, the Chrono Tourbillon is as much an objet d’art as a temporal compass. Inspired by the theme of water, this watch revives the feelings of the first passengers who discovered the famous steamship of the White Star Line. The secrets of its motorisation are revealed through the openworked dial: each tooth and each intricate component of the chronograph and tourbillon are immediately visible. The perfectly forged metal of the case evokes the power of the boiler room and the curves of the portholes through which voyagers could view the immensity of the world outside. The metal of the bezel, stemming from the extraordinary fusion of materials from the Titanic recovered from the depths of the Atlantic and steel from the Harland & Wolff shipyard where the Titanic was built a century ago, symbolises one of the secrets of the ocean most cherished by sailors. Simply caressing the grained and rusted bezel of this timepiece is enough to make its owner a privileged actor of History with a capital H. An insider aware of its secrets and ofits unfathomable mysteries. One who knows the value of time past and time to come, and the potential concealed in every second. But above all one who transforms them into unique energy in order to become the hero of his own life, without ever renouncing his own legends and his own desires.